I joined a sort of familiar team on Ravelry, Team Fibernate and Solitude Wool. I’ve known the Solitude Wool women for a few years and I knew a few of the team members, like The Fiberists, but I wasn’t familiar with Fibernate. Unfortunately, I was unable to attend all of the in-person meet-ups and missed out on the neat passport system the team started – attend an event, get a stamp, and at the end of the TdF, the people with the most stamps are entered into a prize drawing. Next year, next year – the events all looked fun and interesting and online encouragement & camaraderie are great, but nothing beats both in person. 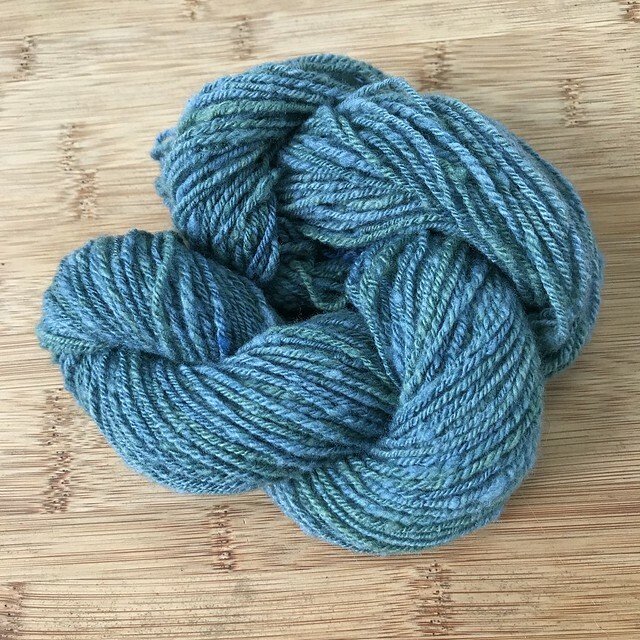 But I didn’t participate in TdF at all in 2016, so I’m just happy I spun this year and had a team to keep up with in terms of pretty yarn making pictures. I didn’t have any specific goals in mind this year other than to spin each day, which was easy until I got the Wonder Woman Shawl commission. 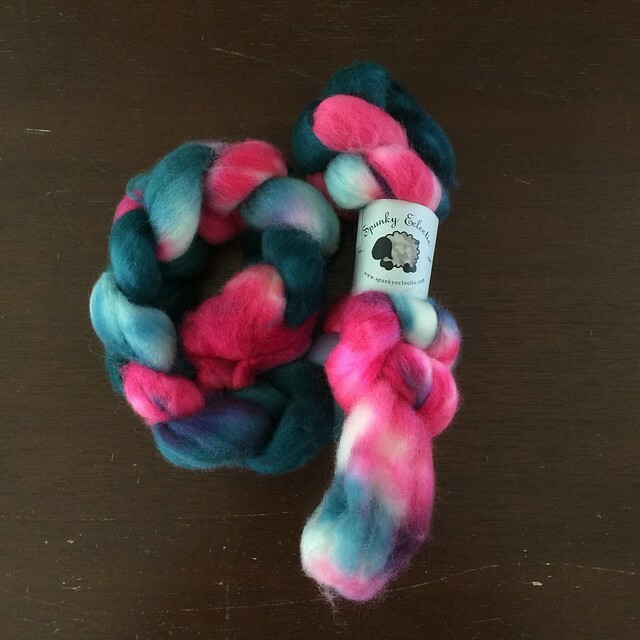 I began the Tour spinning a braid of Spunky Eclectic BFL on my spindles since I was out of town that first weekend. 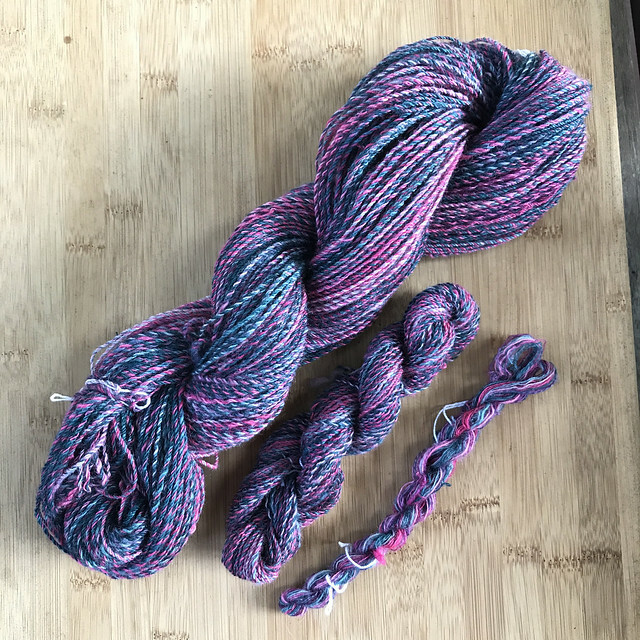 I initially just split the braid in half and started, but I decided I didn’t want to do a 2 ply or chain ply it – I wanted to break the colors up more and try fractal spinning. So when I got home, I guestimated how much I’d already spun (not much) and split the remaining fiber into thirds. I continued to spin the first third as it was dyed, with the color sequence pink, teal, pink, teal, pink (or something like that). The second third I broke in half, then in half again so I had 4 thin strips of roving: (pink, teal, pink, teal, pink) x 4. And the last third, I broke into 8 even thinner strips of (pink,teal, pink,teal, pink). In theory, this breaks the color up enough so that when plied the resulting yarn is less likely to be a solid color. The yarn I ended up with is mostly the classic barber pole look that results from a fractal spin, but I think a fractal spin is more suited to 3 or more colors because there were a few spots where I ended up with a solid strand, though some of the plies varied tonally. The other thing that I didn’t even think about was the visual blending of the colors – the resulting skein is much more purple than what I anticipated. When the braid was dyed, the pink and teal mixed in a few places to make purple (or perhaps Amy dabbed some purple in a few spots), but I didn’t think the final skein would have the overall purple tone it does – it’s kind of magical. Caveat: color theory is a weak point for me. I did take a color theory class at one of my local yarn stores with an indie dyer who shall remain nameless because instead of starting with the color wheel and jumping into actual theory, she started and ended with colors in nature, which is more color inspiration than theory. I know there are resources online for studying color theory, I just haven’t gotten around to using them after than expensive and deflating experience. Technique-wise, I spun all of the singles on spindles, winding off the finished singles into a plying ball, my first time using one. I used my center pull winder to make a 2 ply ball and then made a 3 ply ball using that and the singles right off a spindle. I didn’t account for the difference in tension between two plies coming from a ball and one being pulled from a spindle, so my plying ball was kind of doomed from the start to be wonky. The final 3 ply yarn shows this in spots where I was unable to correct the mismatch in ply length that resulted from the tension problems while winding. I think it’ll be a while before I try another plying ball. A batt of merino (not cormo – whoops) that I dyed all the way back in 2011 using indigo and butterfly bush. 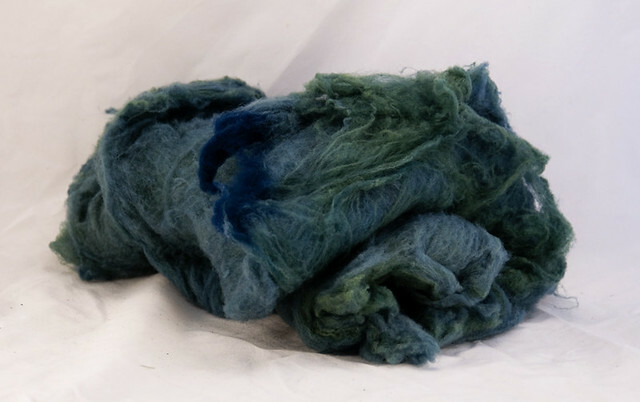 The batt was 1.8 oz (53g) and semi-felted in places. I decided to chain ply the final yarn (no more plying balls, thanks!) and began spinning straight from the batt, which was semi-felted in places. Rather than stopping and running the whole thing back through my drum carder, which would make more neps than what I was already encountering, I just tore the batt into one continuous strip 1-2″ wide. I didn’t finish spinning this batt until yesterday, long after the tour ended. I chain plied it on the porch in the afternoon since it was so nice out (in the upper 70s, low 80s), and then washed and whacked it and this morning it’s dry. It did turn out a little more neppy than I thought it would; I ended each spinning sessions with neps that I had picked out surrounding me on the floor and thought I got them all, but the final yarn shows more. Anyway, I’m happy with it and I think I’ll continue to spin down my fiber stash even though Tour de Fleece is over. In the spirit of my Monday lists, Done! I like how the batt cleaned up into beautiful yarn–even if it was slightly felted in places. It came out beautifully! And you likely know by now: I am a sucker for purples, so the first spin looks perfect to me 🙂 I’m glad you enjoyed the tour. Your team sounds like fun. Oh, I agree – I don’t think I’ll ever try dyeing a whole batt again! Locks & roving & yarn: yes; a batt: no.